Yay! Welcome back and feel better. I enjoy your reading your blog! Keep the real mess coming. Duh damn spell check. Keep the real ness coming. 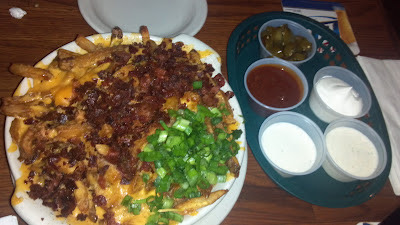 I recognize Snuffers Cheese fries anywhere. Even if you didn't want to mention them, I will give them a shout out. Damn right the best in the world. I don't have stomach/reflux issues really, but I do have arthritis problems and the only medicine that ever worked for me was taken off the market. I live in constant fear of a bad outbreak, I could be crippled. I feel ya sister.